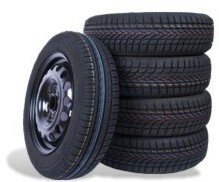 Here you can find steel wheels packaged as a set with a wide range of summer, all-season or winter tyres for all common cars, SUVs, off-roaders, vans and light commercial vehicles, balanced and mounted, ready to be fitted to your car. Please be aware that all cars approved for use in the EU after November 1 2014 must be equipped with tyre pressure monitoring systems (TPMS). Should your car already have an active TPMS, you can buy tyres pre-fitted on steel wheels with a sensor custom programmed for your car.